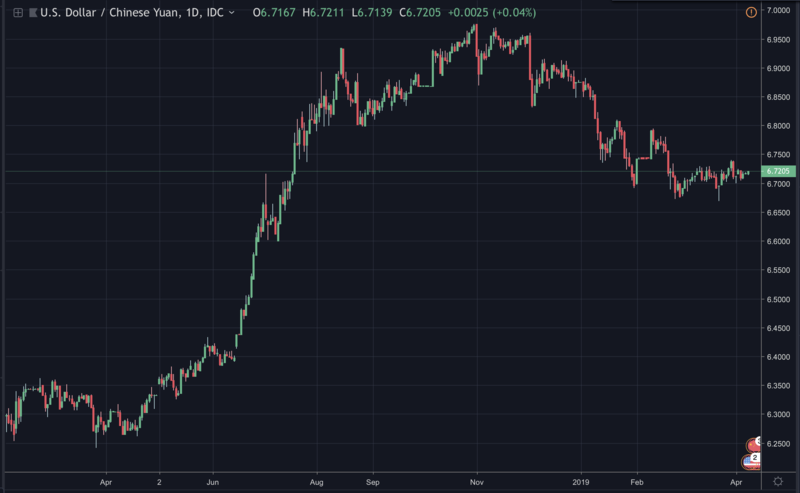 One CNY is a lot cheaper if you buy it with USDT than actual dollars as the crypto stable coin proves to have some additional utility. Tether is currently handling an incredible $18 billion in trading volumes. Fake some of it, but not all of it. A site that tracks only ten exchanges deemed to not fake volumes, thus limiting itself considerably due to not counting many local exchanges such as in Brazil, South Africa and so on, has Tether’s volumes at about $600 million. This great success story might be due to China’s Central Bank (PBoC) which has banned convenient crypto exchanges. The ever wealthier Chinese citizens, thus, go Over the Counter (OTC) to primarily two of the world’s biggest crypto exchanges, Huobi and OKex. There, they want to buy Tether because then they can send it to crypto only exchanges where they can buy whatever coin they want. 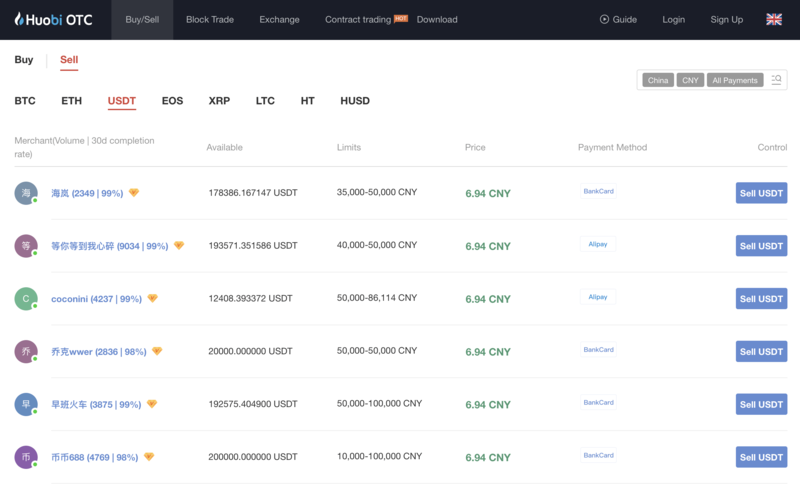 One USDT was worth 7 CNY at one point. Currently it stands at 6.95 CNY. One bank printed actual USD is worth 6.7 CNY or about 5% less than USDT. CNY/USD price, April 8 2019. While the dollar has fallen a bit against CNY since December – coinciding with its fall in price against cryptos too – USDT’s worth against CNY remains at recent highs. That’s because a new pipeline of sorts has been created after PBoC did the unthinkable in September 2017 and completely closed crypto exchanges rather than regulating them. OKCoin and Huobi, the biggest crypto exchanges since 2013, had to shift their operations off-shore and eventually opened peer to peer trading. 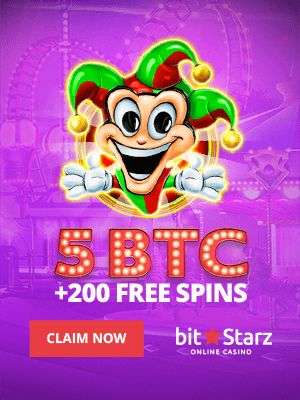 That is individuals put up offers online and accept offers, with the actual exchange of fiat happening by the individual himself sending the fiat directly to the receiver’s bank account. 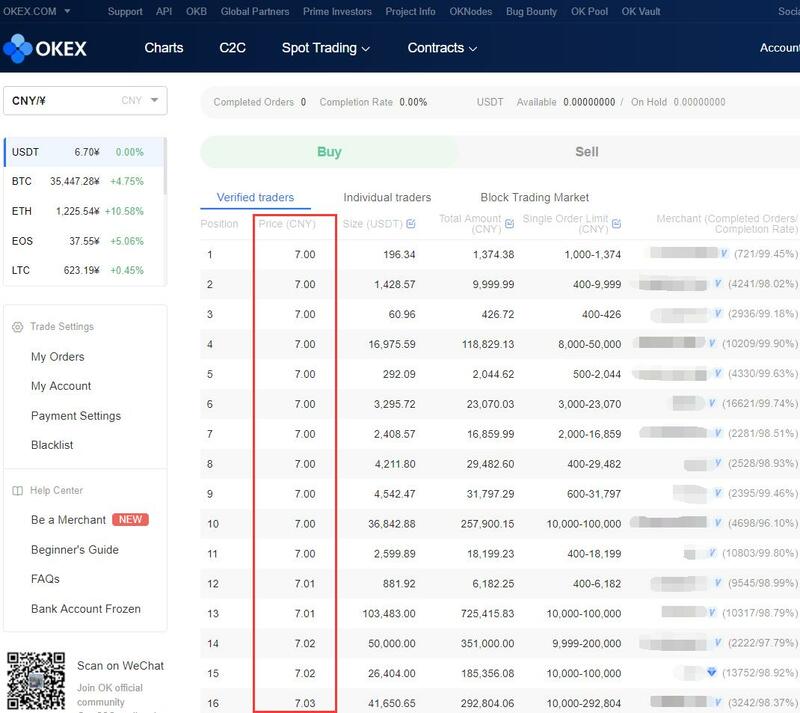 While in a centralized exchange the fiat is sent say to Huobi’s bank account, in OTC trading Huobi has no real involvement. Through this unstoppable method, CNY enters the crypto market primarily by it first being exchanged for USDT. Once the Chinese citizen has USDT, he is free, for at this point he or she – or perhaps “it” if it is a company – has a dollar pegged crypto token that runs on top of bitcoin’s network. Meaning Tether is kind of like bitcoin. So just as you can send bitcoin to whatever address anywhere in the globe with no one able to stop you, likewise with tether except USDT is quite a bit more centralized on how the peg is handled and also at the crypto token level because Tether is known to have previously frozen hacked funds. There are now decentralized USDT like solutions such as DAI, but that’s still quite a new thing that needs to grow a bit slowly with it hitting a ceiling of $100 million DAI, which might be lifted. Whether USDT, DAI or whatever other stablecoin, Chinese citizens now no longer need to sit on the sidelines while the financial and digital revolution unfolds. In fact, they are watching it in real time as Baidu searches for bitcoin trend (featured image). Meaning we can say welcome back, and to those who said they can’t stop cryptos, but they can delay it, we can now say the revolution can not be delayed. For bitcoin, more than just a currency and more than just an asset or a technology, is an idea whose time has clearly come.